Fereydoun Farrokhzad, (in Persian: فریدون فرخزاد) was an Iranian singer and opposition figure. Fereydoun Farokhzad, a poet, a singer who during the time Khomeini era. He was stabbed and was beheaded with a knife on 8th August 1992, in Bonn, Germany during the time of exile from the Islamic Revolution. He was a great entertainer and trained many great Persian singers currently living in LA. Known by his supporters to be an educated patriot who spoke out against the Islamic Republic . Farrokzad was always present during many demonstrations and always spoke out loud and clear against the Islamic Republic. His sister Forough Farrokhzad was a famous Persian poet who was killed in a car accident many years before the Islamic revolution. Before the Islamic Revolution he had a very popular live show on Iranian TV called "Mikhak-E-Noghrei" which was widely seen by Iranian people. Married twice. Once to a German woman and second time to an Iranian. He has a son named Rostam. His father worked in the army and was a strike man. Concert of Fereydoun Farokhzad in London, patriotic speechs and songs and speechs against the islamic regime. Fereydoun Farokhzad Iranian artist and political activist who was brutally murdered by the Islamic Republic occupying Iran. Ravanesh Shaad! 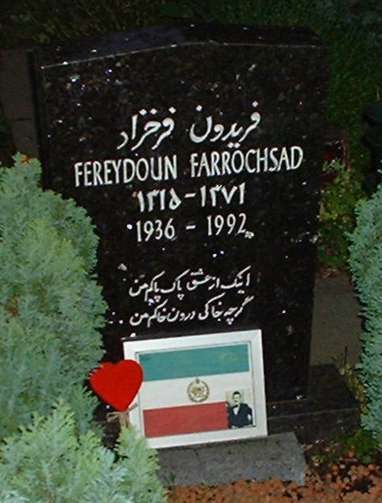 Fereydoun Farokhzad (PHD in Political Science) stabbed and beheaded with a knife on 8th August 1992, in Bonn, Germany by the order of clerical repressive corrupt fanatical regime. He was a great Entertainer and trained many great Iranian singers currently living in LA . او پس از مسافرت به تورنتو-کانادا و شرکت در يک سری مصاحبه تلويزيونی که می گفتند تهيه کننده آن وابسته به جمهوری اسلامی است به قتل نا جوانمردانه اش سرعت بخشيد. مقامات قضايی آلمان چند روزی مسئله اين قتل را پی گيری کردند و آنگاه پرونده را بی هيچ توضيحی مختومه اعلام کردند. بی آنکه صدای اعتراص جدی شنيده شود ويا گروهای اپوزسيون که اين روزها دفاعشان از حقوق انسانی و آزادی فقط به زندانيان سياسی خودی محدود می شود صدائی برای دادخواهی بردارند.!! اما بخش اعظم اپوزيسيون به اصطلاح مترقی آشنا به دموکراسی(!!) فقط نگران سرنوشت يک سری زندانی به اصطلاح سياسی هستند که خود رژيم آنها را برای نفوذ دادن در ميان مخالفين علم کرده و تربيت می کند. مثل فخرآور (سياوش)، محسن سازگارا و اکبر گنجی و اشکها يی که از چشمان اينگونه مشتاقان جاری شده، گويی انتهايی ندارد. اما هرگز در مورد بدن مثله شده فرخ زاد ها وده ها انسانی که در خارج از ايران ترور شدند و ياشوان قادری ها، شهريار شفيق ها، طباطبائی ها، دکتر مظلومان و هزاران جان باخته در طول 28 سال حکومت جهل و جنون و جنايت کوچکترين تاثيری در قلب حساس و گرايش های انسانیشان بر جای نمی گذارد! امروز ما کتاب نا تمام ناکامی های تلاش های مذبوحانه کسانی همانند ابراهيم نبوی ها، و بهنودها، هوشنگ امير احمدی ها، عليرضا نوريزاده ها، احمد مدنی ها، برای پرده پوشی طرح هائی که به قتل های زنجيره ای و قتل های خارج از کشور وديگر جان باختگانی همانند صد ها نفر دلاور تيز پر که در پايگاه شاهرخی به اشاره يک عده پذيرندگان آيات شيطانی صورت گرفت را از بر کرده ايم. ذره ای آسمان نمی بينم. The Iranian clerical regime which the European Union has unwittingly appeased for decades continues to claim unashamedly that it does not condone, much less support terrorism. And yet, the testimony and documentary evidence including annual reports by the United Nations, the U.S Department of State, and other concerned bodies, human rights groups, and the world press have established beyond any doubt that the leadership of the Islamic republic has throughout the past 23 years authorised, sponsored, and directed diverse acts of global terror including the liquidation of over 120 Iranian dissidents in their chosen countries of exile by assassins dispatched from Tehran. It is a cautionary tale that must not be forgotten. From the moment they seized power Ayatollah Khomeini and his henchmen were determined to murder the deposed monarch. An Islamic court in Tehran had, in fact, sentenced the dying Shah, Empress Farah, the Crown Prince, and other members of the Pahlavi family, to death in absentia on a preposterous charge of �waging war against Allah. The international press speculated that Khomeini had hired �Carlos�, the notorious Venezuelan terrorist, to murder or kidnap the Shah and his family in exile. More seriously, Yasser Arafat, leader of the PLO, was reported to have offered the services of his commandos to the Islamic Republic for the sole purpose of eliminating the Shah. Arafat's ignoble offer was a calculated ruse to persuade revolutionary Iran in joining his campaign against Israel. On December 7, 1979, Prince Shahriar Shafiq, the Shah�s nephew, Princess Ashraf�s second son, was walking on a Parisian street carrying groceries home to his sister�s apartment in the Rue de la Villa Dupont, a cul-de-sac in the fashionable 16th Arrondissement. A competent officer in the Imperial Iranian Navy and a commander of the Persian Gulf fleet of Hovercraft, Prince Shafiq had fled the Islamic revolution in a pleasure boat after a dramatic chase from the port of Bandar Abbas and across the Gulf to Kuwait. Nine months later in Paris he was busy plotting with other exiles and his contacts in the Iranian navy to spearhead a counterrevolution from Kish Island. But any hopes that he may have had for his country ended that cold afternoon when a young man, later identified as a certain Boghraie, pulled out a 9-millimeter pistol, and shot him in the back of the head. Paris, once the base for Khomeini�s campaign against the Shah�s rule, had become the headquarters of Iranian exiles agitating against the daily atrocities in their homeland. One of the most colourful leaders was Shapour Bakhtiar, a liberal and the Shah�s last prime minister who had valiantly resisted the Islamic revolution during his ill-fated 37 days government. Having fled Iran he had immediately founded the National Resistance Movement. �Iran will never die,� became a famous motto for the hundreds who flanked to his side. Dividing his time between a busy office on the Left Bank and his elegant apartment at 101 Boulevard Bineau in the Paris suburb of Neuilly, Bakhtiar issued manifestos and tape recorded messages to his followers inside Iran calling them to overthrow the �mullah dictatorship.� On July 18, 1980, Bakhtiar was in his pyjamas fixing breakfast when a violent shoot-out broke out in his apartment between his bodyguards and Arab terrorists. One guard, 23-year old Jean-Michel Jamme, and an innocent French lady in the building, were shot and killed. Two days later, the Tehran authorities announced the crushing of a plot by hundreds of former air force officers and the �Neqab� (�Mask�) organisation who claimed to have direct links with Bakhtiar�s office in Paris. In the weeks that followed, hundreds were executed after brief trials. Fearful of a counter-revolution, the Islamic revolutionary secret services went into deadly action. This time they chose another Iranian by the name of Ali Akbar Tabatabai, as their target. A former press attache at the Iranian Embassy in Washington under the monarchy, Tabatabai was known as the main critic of the Khomeini regime in the United States and leader of the Iran Freedom Foundation. On July 22, 1980, Tabatabai was shot three times in the abdomen at his Bethesda home in Maryland by an assassin disguised as a postman. Forty-five minutes later, at 12:34 P.M., Tabatabai was pronounced dead at Suburban Hospital. The man who fired the semi-automatic Browning was David Theodore Belfield alias Dawud Salahuddin, a 29 year old African American Muslim who had been paid five thousand dollars for the job. After shooting his victim, the assassin had escaped the crime scene with the help of a friend who was waiting with the rental car, and they made their way to Montreal. When the Shah, passed away in Cairo on July 27, 1980, a group of monarchists rallied around his son. On October 31, on the occasion of his twenty-first birthday, Reza Pahlavi, called on all patriotic forces inside and outside Iran to unite behind him and �end the terrible nightmare that has gripped our homeland.� Vowing to reign as a constitutional monarch he kissed a copy of the Koran and stood at attention while the pre-revolutionary national anthem was played. A film of the Kubbeh Palace ceremony was delivered to sympathisers in Athens and broadcast clandestinely into Iran. Millions of Iranian exiles, mostly the cr�me de la cr�me of imperial Iran, began to hope again. Former politicians and generals, singers, artists and writers, students and businessmen joined the chorus of liberation. Meanwhile, a professional army of Iranian counterrevolutionaries was taking shape on the Iran-Turkey frontier, for eventual deployment in a �liberation drive� planned by General Gholam Ali Oveissi, the commander of the imperial Iranian army. This force consisted of officers and men from elite divisions of the late Shah�s military and was quartered in 22 makeshift barracks in eight Turkish villages � and at five clandestine bases inside Iran. Estimates of this monarchist force ranged from 2,000 to 8,000 men although exiled officers claimed that they could raise up two full divisions (22,000 men), provided they received financial support. One potential source of new recruits were the 100,000 Iranian war prisoners held by Iraq to be prepared to join anti-Khomeini forces in exchange for their freedom. A stream of visitors, including colourful emissaries from Iranian Kurdish chiefs and political advisers from the exiles in Paris, created an impression of feverish activity in what was a snowbound remoteness. On February 7, 1984, assassins shot and killed the 64 year old General Oveissi and his brother as they left an apartment in Paris. Oveissi�s death dealt a major blow to the anti-mullah opposition forces. A mysterious group called �Islamic Jihad� claimed responsibility from London. The French police were never able to capture the assassins. After General Aryana�s death from a heart-attack the liberation armies evaporated. Next to Bakhtiar, Ali Amini and Ahmad Madani, other opponents of the mullarchy such as the ex-president Abol Hassan Bani Sadr and the fugitive Masoud Rajavi of the Mujaheddeen Khalq were also busy forming their organisations. Clandestine radios and exile publications exposed the Islamic republic�s use of torture, executions, stonings, terrorism, and assassinations as instruments of state policy. Enjoying diplomatic immunity the agents of VAVAK nested at the Iranian embassy in Paris while successfully infiltrating these groups and waiting to strike. Rajavi and his supporters moved to Baghdad where they raised a militia army and conducted a wave of terrorist attacks on members of the Islamic regime. In London, exiles staged huge protest rallies every Sunday at Hyde Park Corner and in front of the Iranian Embassy. At 2:30p.m. on August 19, 1986, a bomb exploded in a Persian video store in Kensington killing Bijan Fazelli, the 22 year old son of Reza Fazelli an opponent of the Islamic republic who had produced a number of comedy shows deriding the mullahs as �corrupt and evil.� The brutal assassination of Ali Tavakoli and his son Noureldeen on October 2, 1987 shocked and intimidated the Iranian community. Both men were active monarchists and had been found shot in their own home. After that anti-regime demonstrations dwindled to a mere few. Their murderers were released a few years later. Dozens of other opponents were murdered or injured in Rome, Istanbul, Karachi and Dubai. The scope of the terrorist activities launched against individual organisations opposed to the clerical regime and nationals of other countries took place at an alarming rate and coincided with Hashemi Rafsanjani�s rise to power as the President of the Islamic republic and the European Union�s eagerness to �improve commercial and political ties� with the �moderate elements� in the Islamic regime. Despite the complications caused by the late Khomeini�s fatwa against the author Salman Rushdie, the EU and Iran continued their �critical dialogue� at the expense of Iranian opposition leaders who now lived in daily fear of assassination. On April 24, 1990, Dr Kazem Rajavi (56), a human rights activist and the brother of Massoud Rajavi, the leader of the Iraq-based National Council of Resistance, was assassinated by a four man hit team that opened fire on his car outside his home in Geneva. Two months later, the Swiss Police issued a report saying that the killers carried Iranian government service passports � �all issued on the same date� � and flew between Tehran and Geneva on Iran Air. Soon afterwards, Cyrus Elahi, a high-ranking member of Dr Ganji�s pro-democracy opposition movement, the Flag of Freedom Organisation, was assassinated in cold blood. He was hit by six 7.65 revolver bullets at about 9:30a.m. on October 23, 1990. Elahi�s body was found in the lobby of his Parisian residence at 8 Rue Antoine Bourdelle. His assassination f! ound little echo in the press. On April 8, 1991, Dr Abdolrahman Boroumand, a close adviser to Bakhtiar, was stabbed to death outside his home. On a stormy night, August 6, 1991, in one of the most shameful acts of terrorism a three-man commando team sent from Tehran and posing as his supporters brutally murdered the 77 year old Dr Bakhtiar and his secretary, Soroush Katibeh. Both men were stabbed to death under the very noses of their French security. Bakhtiar�s corpse was found the next morning at his villa in Suresnes. He was lying on his leather couch, his throat and wrists cut by a kitchen knife. In the sensational trial that followed in Paris in late 1994, it became clear that Bakhtiar�s assassination was planned and carried out with Tehran�s direct involvement. Two of the killers fled to Iran, another was extradited from Geneva but was later acquitted. Many Iranians, including the families of the victims, blamed France�s diplomatic rapprochement with Tehran for the deaths. Two years earlier, in February 1989, Roland Dumas had visited Iran to discuss trade opportunities and on July 27, 1990 President Mitterand had ordered the release of the Lebanese terrorist, Anis Naccache, who had led the first attempt on Bakhtiar�s life in 1980. Relations between Tehran and Paris led to lucrative contracts and greater restrictions on the activities of the Iranian opposition. Mitterand�s plans to visit Tehran never materialised due to the public outcry. At the Group of Seven summit, a meeting of the seven leading industrial states, in Munich in July 1992, the United States proposed a strong condemnation of Iranian policies concerning terrorism, human rights, and nuclear armament. The Europeans, especially the Germans, opposed the American initiative, leading to its withdrawal. Not surprisingly, the Islamic republic�s agents operated throughout Germany with exceptional ease. On August 9, 1992, Fereydoun Farrokhzad, a well-known singer and opposition figure, was stabbed by an assassin at his home in Bonn. Three days later his body was found lying in a pool of blood with his dog whimpering beside him. A month later, on September 17, Sadegh Sharafkandi, who succeeded the murdered Qassemlou, together with two of his associates, were gunned down mafia-style while they ate at a Berlin restaurant called Mykonos. German police arrested the leader of the hit squad Kazem Darabi (an Iranian) and four of the eight suspected Lebanese perpetrators and put them on trial in Berlin. The Mykonos trial lasted three and a half years and involved 246 sessions of the court, 176 witnesses and thousands of pages of documentary evidence. Despite the German Government�s attempts to pressure the Court to refrain from pointing a finger at Tehran, the president of the tribunal, Judge Frithjof Kubsch, declared that the �atrocious murders� were ordered by the �highest state levels�. In March 1996 an international arrest warrant was issued for Ali Fallahian, Rafsanjani�s Intelligence Minister, for his role in the assassinations of Iranian dissidents in Germany. The emergence of Khatami in 1997 and the endless charade of hardliners versus the reformers inside the Islamic republic has provided a suitable excuse for the EU to maintain their heads in the sand whilst arguing that dialogue with Iran will help the reformists. In December 2002 the EU opened its talks with Tehran on the basis that it will not sign a proposed trade agreement unless the Islamic republic shows progress on human rights and terrorism concerns. Many Iranians remain cynical. It is all about money they say. Even with the widespread movement towards greater freedoms in Iran they believe that the EU will continue to shrug their shoulders at the regime�s misdeeds. As Reza Pahlavi, himself a target of an assassination plot six months ago, said at the National Press Club: �The only way to help the Iranian people achieve freedom is to stop cutting deals with the Islamic regime. "